Do you ever feel stuck in a creativity rut when it comes to displaying flowers? My mind always gives me two choices: vase or jar. Ok, fine, that’s cool and looks beautiful! But you can get so much more creative than that! So let’s try to stop being traditionalists and let’s start thinking out the vase! Let’s be clear. There is nothing wrong with the traditional jar or vase. Nothing at all. They can still be unique and different. Use a bottle wrapped in seagrass, or embossed mason jars, and they can come in different shapes as well! So if you aren’t to keen on the idea of thinking outside the vase, there are still plenty of options to get creative and still be traditional. There is something about the contrast of industrial, galvanized metal and soft, colorful florals that is really quite beautiful! And if you fancy a little more obvious farmhouse style, then milk cans are for you! This Metal Flower Holder has a flat back so you can easily hang it on your wall or your front door to give an extra welcoming touch! The distressed edges and sturdy leather strap add the right amount of rustic accents when paired with the soft colors of the flowers! Milk cans…seriously, I never thought much about milk cans before I started working here. I must admit, they are excellent for floral displays. Not to mention, they fit right in with country and trendy farmhouse decor! So who else is guilty of having lots of little “trinkets” around the house because they were “soooo cute!” And now they are just dust collectors?! No judgement, no shame. Who would have thought that some of those things could easily turn into FLOWER HOLDERS. This is literally my favorite display right now. Probably because all of the bright and cheery colors! Perfect for spring and summer. I would keep it all year! Another beautiful style of trinket that you might have just been tossing change in! Toss in some florals and really make it part of your home decor! If you are a basket collector, this is a fun one for you. Don’t let those baskets just sit empty in a corner, under a bed, or in the back of the closet. Spruce those beautiful baskets up with florals, greenery, picks, bows, and put them on display! 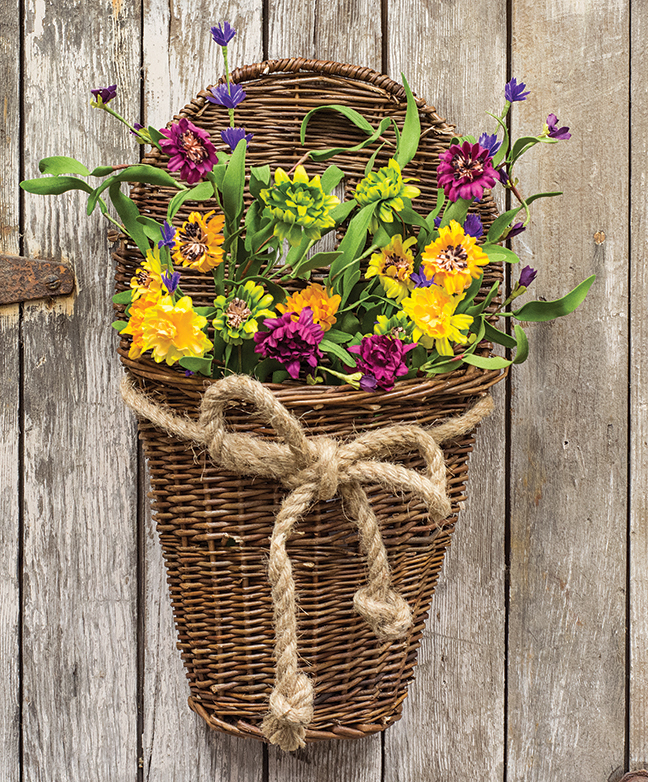 A nice bow around a basket can add dimension, and color. Baskets with a unique shape like the cone basket below, can add some texture to your space and it looks pretty cool tool! This one is totally my jam because it takes hardly any effort! Simply place your flowers in the box and be done! You might need to fluff them a bit so they aren’t just laying flat and you can’t see them. But this one is so simple, so beautiful. Maybe even add in some tall LED pillar candles! After seeing some new, out of the vase ideas, are you up for the challenge? Tell me about the untraditional flower holders you use, send me a picture, and post on our Facebook page! Inquiring minds want to know, and see your creativity!